By the Good Friday of 1969 (April 4th) Geoffrey Bocking [born 1919] could have been dead for several days. It would be a week before his letters to his girlfriend and to his separated second wife would arrive on the doormats vacated for the Easter holidays hinting at what he was about to do. But it wasn't until April 20th that a friend sent by his girlfriend's concerns, and knowing of his depression, called around to his home and found him dead from barbiturate poisoning. Propping himself up on his day bed with his journal and a glass of whiskey and a cigarette he, with characteristic rigour in his research process, recorded his descent into unconsciousness; "how strange... " he began and then as he felt the rush of enveloping darkness he composed a poem. It ends "love, love, love...." with the line slipping off the page. It is still hard for anyone that was there to relate the horror of the aftermath. All I remember is being taken out of school for an unexpected stay with family friends and after the cremation and funeral had been competed, my sister and I sitting on the stairs as our mother told us that he was dead. I was only seven at the time of his death so I cannot write about my father in any concrete way principally because so little evidence remains that I can refer to apart from the emotions I felt afterwards. To say his death turned my world upside down would be an understatement but now, at the fortieth anniversary, and as I approach the age he was at that time, I feel there is enough emotional distance to mention him outside of my family and friends and I could not let this significant date of what would have been his 90th birthday pass without any remembrance at all. A few years ago I discovered two photographs of my father and with the help of a defence picture archive I was able to identify the time and place they were taken. 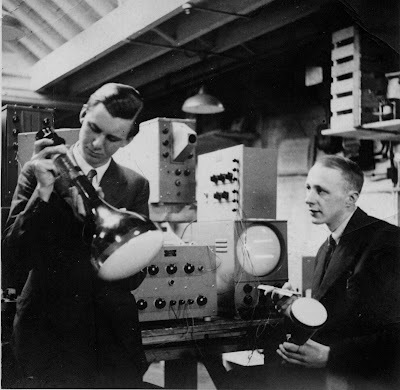 Here he is on the left in his twenties working at Cossor in a secret research laboratory at Highbury during WWII. 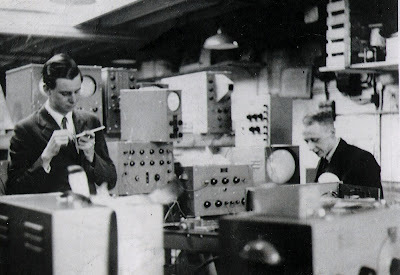 The equipment that surrounds him was used to calibrate the top secret radar transmitters and receivers during manufacture and my father specialised in circuit designs for the equipment that tested and calibrated radar sets. There is at least one article by him in an electronics journal of the time. In 1941 in the Journal of British Radio Engineers he discusses the problems of stabilising fluctuations in power supply. Every time I plug in my laptop I think of him. The man he was with in the pictures recalls my father being concerned that he was thought of by his colleagues as a very difficult character. My father's war work vindicates his status as a conscientious objector but I consider it a testament to his intellect that he convinced the magistrates at his tribunal of his pacifist beliefs; arguing on moral and not religious grounds. I can read in his letters to his first wife that he felt later this position had cost him dearly when commissions for public building projects in post war reconstruction went to architects that had distinguished service records. He did design the shop for Penguin Books at the Festival of Britain and a revolving wire rack to hold the paperbacks and his bookshop in Kensington Church Street opened in 1956 would not be out of place today. Its exposed internal pipework and distressed steel fascias with the shop sign cut in plate steel with an acetylene torch and left to rust pre-figured the post-modern aesthetic of today. But there is not much other evidence of his work. Later on in life, by the time I was born, my father was a Senior Lecturer in Design at Hammersmith College of Art and Building and before that had taught at Corsham College of Art where he had also founded a cabinet making workshop. 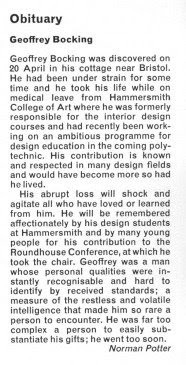 He was part of a tight social circle of designers including Anthony Froshaug and Norman Potter who - by virtue of living a long and well documented life - are now much better recognised than he is. Potter says in his autobiography "that remarkable man Geoffrey Bocking (he burned himself out, if one can speak in such terms and committed suicide). For some years we were a trio..." I don't bear any resentment or malice but I feel Potter's and Froshaugh's published works - therefore some of their reputation - has the imprint of constant discussion and argument about what is design with my father. Somewhere I know there are a couple of houses for artists and workshops for a weaver and a potter and I recall him telling me amongst the machines had designed was one that shelled peas. Some scraps of paperwork attest that several schools and a few country estates, Tregothnan amongst them, and some smart London flats had ordered his custom made furniture but I doubt any survives. I have established he was good friends with the lyricist Michael Flanders and he designed and built the interior of Michael's flat in Hampstead, which was specially adapted because its occupant lived in a wheelchair and it was photographed for House and Garden. I was only two and my sister was a newborn when the great man came to visit and so was promptly put to bed but when R. Buckminster Fuller came to our house, the event became part of family legend and an indication of why my parent's marriage failed. One afternoon my father rang my mother with the most matter of fact casual request that as he and most of RIBA was coming to our house in a hour to hear Fuller speak, could she possibly clear away the drying nappies and rustle up some tea... While Fuller held court in our living room for several hours - sitting on an original Rietveld chair fetched from Anthony Hunt who was a neighbour - my mother crept into my room to collapse from exhaustion. A year before he died my father presided over the MORADE conference at the Roundhouse to determine the future of arts education. It was a hugely controversial issue at the time spurred by student activism such as the Hornsey sit-in. The most telling thing I know about my father is that Bocking is not a terribly common name and several times when I have been introduced to people, especially in the design world, is that they then say "Bocking, Bocking, not by any chance related to Geoffrey Bocking are you?" When told I am his son there is often a floodgate of emotional confessions about how inspirational a teacher he was. I may expand on this further if there is ever time and emotional energy in reserve but thanks to Google, perhaps anyone else looking for any further evidence of his work and life will find this and share whatever else they have. I met Geoffrey in Corsham nearly 60 years ago through my friendship with Norman Potter who with George and Ray built a caravan for me at the workshop. Geoffrey said to me one day "You're looking a bit down in the mouth today, John. What's the matter?" I replied "I started the day with a list of ten things to do and I've only managed five of them". His reply has been a watchword throughout the rest of my life. "It's a good day when you get one done from a list of ten!" I was a student at Bath Academy in Corsham. I met Geoffrey on two or three occasions and remember him as a gentle, sympathetic and delightful man. I was going through a very bad time, having, at my parents request given up my studies at Hartlepool College of Art to to train as a teacher at Corsham. The methods of teaching at didn't impress me. The requirement to obtain a pet during the second term had resulted in an encumbrance in the form of a Nubian goat. When I returned to Hartlepool at the end of my first year ( I was expelled for my mutinous performance) Geoffrey very kindly took care of my goat for me. I don't think I ever thanked him properly. I have thought of him so often since. I can't offer any evidence of his work, only of the man who went out of his way to help and cheer me.